In August 2014, Michael Brown was killed on the streets of Ferguson, Missouri. The events of the next 100 days would dramatically alter the lives of the community’s residents and affect the national narrative of race relations in America. Joel Pruce, Assistant Professor at the University of Dayton’s Human Rights Center, and Leora Kahn, Executive Director of PROOF: Media for Social Justice, already had a collaborative relationship dedicated to education. In Ferguson, they saw the potential for a project that would bring context to the events of that summer and justice to the stories of those most affected by it. With TOKY’s help, the project resulted in a one-of-a-kind digital storytelling experience. We sat down with Joel and Leora to talk about the process of creating Ferguson Voices. Where did the idea for the Ferguson Voices project originate? Joel: It’s a collaboration between the University of Dayton’s Human Rights Center and Leora’s organization, PROOF [Media for Social Justice]. It was really a product of taking PROOF’s model of doing human rights storytelling for the purpose of peacebuilding. The idea is to highlight individuals who exemplify moral courage. Who do unpopular things at moments of crisis, moments of transition, who stand up, who speak out. Leora: It originated from The Moral Courage Project. How do people do that [display moral courage]? Where could we go to show this in the United States? Joel and I came up with the idea of Ferguson because we were looking at what people were doing, and we were very interested to see if people did change from being a bystander to what I would call an upstander. The Moral Courage Project is a collaboration between PROOF and the University of Dayton Human Rights Center. As an outsider who took a deep dive into Ferguson, did anything surprise you once you started talking to people? Leora: How open they were. There’s a lot of people coming and talking to them and they might have gotten sick of people sort of studying them. I was surprised at the openness of people willing to engage with the project and wanted to tell the story. Joel: It went on for 100 days and that became people’s lives for that period of time. Their lives, in many ways, were not only affected by it, but also disrupted by it. I don’t think I had an appreciation of the impact of that on some of the daily existence. The other major takeaway was there was such a range of different kinds of activities and kinds of contributions that people made, from organizing a rally to doing art with the children who were affected. Every big and little thing that I was just not aware of. (One of the activists featured on the site, Darren Seals, was murdered after he was interviewed and photographed.) How did the death of Darren Seals affect the project, and you personally? Joel: He was a brash guy for sure. After he was killed, going back and listening to the interviews again, it gives you a deeper appreciation for his life and his views and his perspective, particularly because of the brutal way that he was killed. It really was a shocking and horrific death. It raised a lot of questions for us and we talked a lot about it. How do we grieve for someone we don’t really know? I’m sure these are things that journalists are familiar with, but it’s not what I do, so this is all new for me. I think about how you connect with something when you leave covering it. 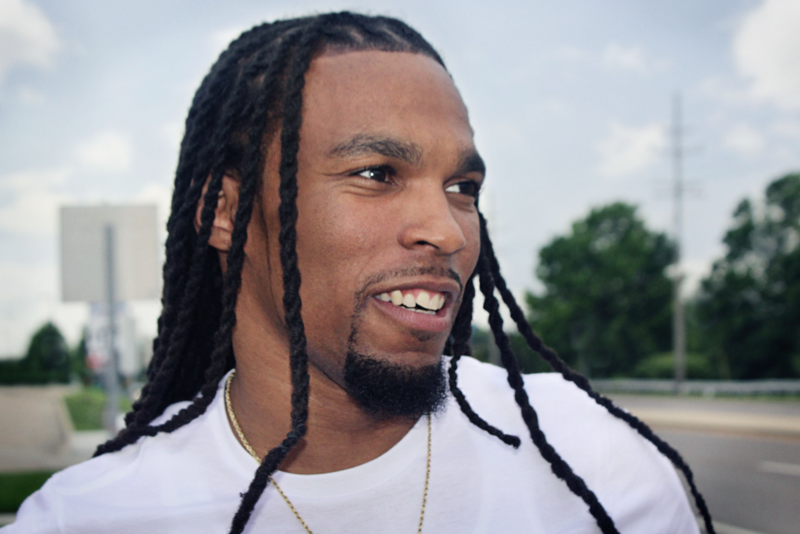 Darren Seals, Community Activist, died on September 6, 2016. Photo by Amanda Dee. As people who’ve dedicated their careers to teaching and encouraging conversation about human rights issues, what is special about Ferguson? Leora: I think Ferguson really restarted a new civil rights movement. I would say we’re still in conflict here, in Ferguson and the United States. The opportunity to show change while we’re in that is a very strong and powerful one. Joel: Fundamentally the most different thing, and this is going to sound unusual, but it’s in America and when we teach about human rights, there is literally a built-in bias to focus on things outside of the United States. It was very intentional on our part to incorporate Ferguson into a human rights lens. Of police brutality, of free speech, and treatment of protestors, of militarization of public space. There’s no shortage of issues here that had these events transpired in another country, we would clearly be using a human rights framework to think about it, to describe it. Tell me about some of the goals you hoped the Ferguson Voices project would achieve. Joel: Our first goal was to do justice to the people’s stories. We really wanted to be faithful. In addition to that, we wanted to elevate people who were left out of the narrative. Certain folks have found that the protestor community has gone on to have bigger platforms, while other people were doing interviews for the first time when they spoke with us. More broadly, we wanted to engage people who think they know everything about Ferguson, but could learn something new. It’s hard and probably too ambitious to say we wanted to change people’s minds because Ferguson is so polarizing. Leora: People can as individuals make change. 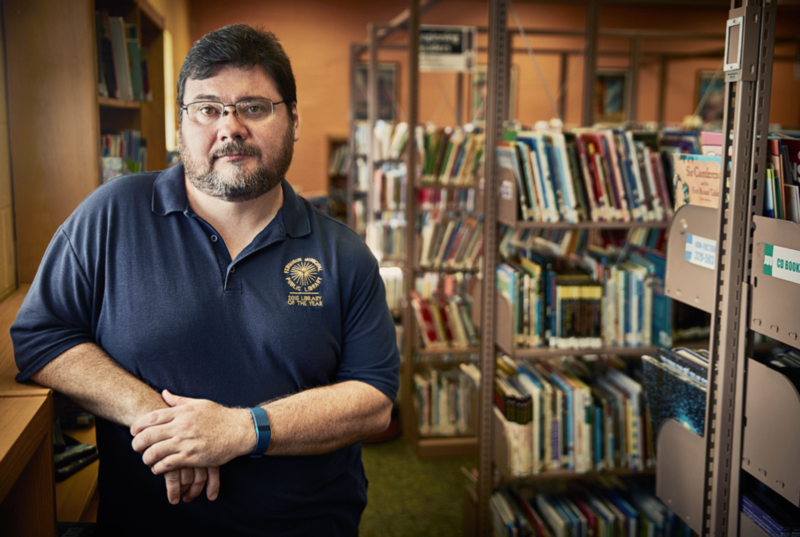 If you take the instance of Scott Bonner, who was the librarian….he never thought of himself as an activist. But it [Ferguson Voices] provides an ordinary person an insight to what you could possibly do to make a change in your community and the events that are happening around you. Scott Bonner, librarian and activist. Photo by Mark Katzman. How did the idea for the web version of Ferguson Voices evolve? Joel: Leora was in touch with Mark Katzman, who is a St. Louis-based photographer who practically volunteered to do portraits for us for our exhibit. He said, ‘You know, I think I know someone in St. Louis who would want to help with our website.’ So much of it came from the creative side of the people working at TOKY, the designers and developers and the account managers who were really able to see where we wanted to go. Leora: I’m used to working just in exhibitions, very non-digital. And, to see how [a website] changed sort of inanimate objects, still photography, and the audio to make it come alive…it’s really powerful. What was it like working with TOKY as a partner on the Ferguson Voices digital experience? Joel: We could never have been so creative and so hopeful to think that we could have pulled off what we were able to pull off with TOKY. We were really moved by TOKY’s commitment to our vision, but it really became very collaborative. Their ability to execute and just do everything so fluidly and so capably was really remarkable. Leora: TOKY managed to bridge what our goals were to the website to make it really accessible and very exciting for people to access it. And that’s really important. We’re so excited that they did this and wanted to work with us. In retrospect, is there anything else you wish you’d done differently, or people you wish you’d spoken to? Leora: I think in retrospect you always need more time. We might not have interviewed as many people. We might have gone into more of a deep dive into the people that we interviewed. Joel: We were in Ferguson for two weeks, so it’s a good amount of time, but it’s also finite and not being local, we weren’t able to follow up as much as we would have liked. We know that we were lacking female voices, particularly black female voices. We were very fortunate to have sat down with the people that we did. So much of this really exceeds all our expectations. The website we know will be incorporated into classrooms and hopefully is itself a historical document of a kind that will have some life in years to come. 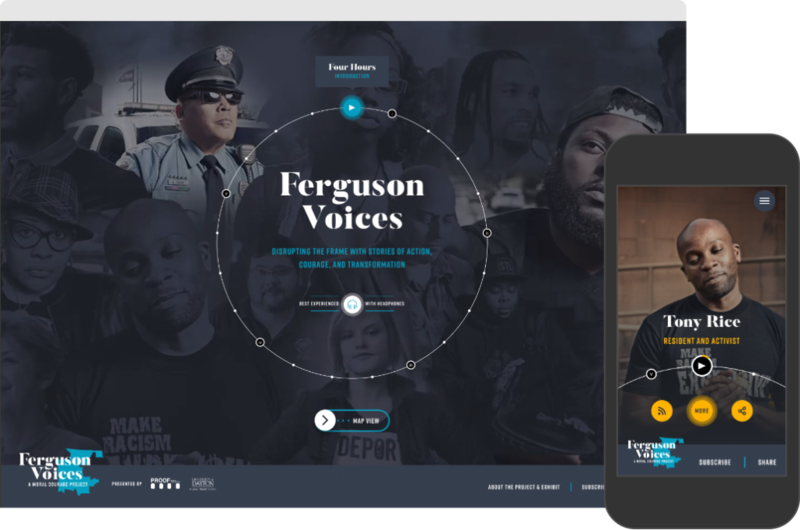 The Ferguson Voices digital experience. Check out the Ferguson Voices experience here. You can also visit the physical exhibit, “Ferguson Voices: Disrupting the Frame,” at the Saint Louis University Center for Global Citizenship atrium through October 27, 2017.